In order to develop business and growth in production and performance, Microsoft Dynamics has developed high-end performance tools, CRM and ERP products. These help in better monitoring of operations as well as boost the productivity and well-maintained customer records. 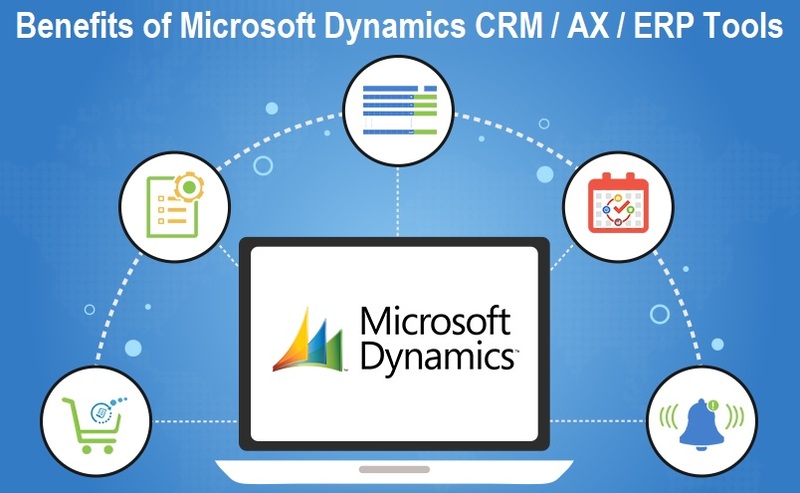 By Microsoft dynamics, the two products - Dynamics CRM and Dynamics AX are popular and are implemented across the globe, each having their own distinct features. Different Tools - Microsoft Dynamics CRM helps to complete all customer interactions and maintain the customer data while Microsoft Dynamics ERP assists the organization to maintain their own transactions and all details pertaining to a particular customer request or customer transaction. The Dynamics AX is a single software platform which enables the company to handle the complete operations structure and monitor it via a single software. It is one of the most used resource planning programs for smart and hassle-free functioning that is implemented worldwide. It provides a complete package of benefits starting from an all-inclusive core functionality that any operations team will require from tracking the employees’ performance, customer records in various status, controlling and managing the financial data, human resources operations, provide smart and intelligent business solutions and thus bring forth customer engagement that improves the overall business processes. It helps the organizations to automate the processing and functioning of their own warehouses completely. This is absolutely time-saving as well as reduces the operational costs by reduced human intervention. It also helps to manage the strategy building and implementing the international transportation and reconciliation of freights. It benefits the employees of the organization as well. It helps to develop easy and user-friendly budgetary and financial reports and strategies as well as the crucial worksheet and timesheet templates with the use of Excel. Probably the most beneficial feature of Microsoft Dynamics is the feature of Up to the minute point of sale, POS. With this feature, any organization can connect with their rich and high-end clients. This benefits the organizations in real-time inventory tracking and checking as well as it comes with several benefits that cater to the backend operations by making them easy and simple. The estimation accuracy thus checking for the availability of products and also limiting the inventory costs by releasing them from the stocks. Microsoft Dynamics proves beneficial to human resources as well by providing a complete solution towards payroll processing and analysis, spot estimation, reporting and estimating the benefits. All data are accumulated in a single platform so that no time leakage occurs in searching for a minute piece of data! It helps in developing social media campaigns, customer interaction via social media platforms like Pinterest, Facebook, and Twitter. Also, it helps in ecommerce sites management. To install the Microsoft Dynamics suite for your organization now to experience superior customer experience along with improved performance.